Hi folks. We are getting ready for everyone’s arrival next week. Today we were cleaning; thanks to Eileen, Joe, Valencia, Anwarul, Leah, Mark and Erik for helping! We got a few things in yesterday and today, and we are expecting more early next week. Hope everyone is getting excited for a really great conference. We are looking forward to having everyone here. We also will be sending out periodic emails regarding conference details. One change already, dorm check-in will be in the LIBRARY, not the dorm. Email me if you have any specific questions carrie.marten@purchase.edu. 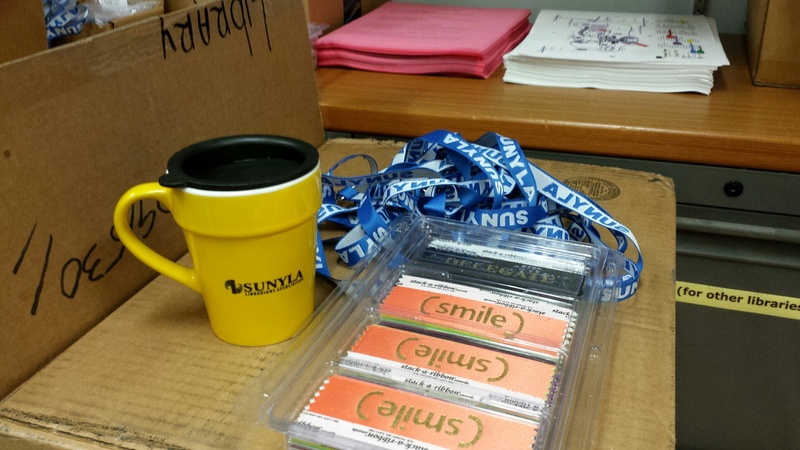 Never attended a SUNYLA Conference? See if you are eligible for the Daniel F. Kissane Memorial Scholarship. Attend your first professional conference – all expenses paid! The SUNY Librarians Association (sunyla.org) invites you to join us at our annual conference in June and to apply for the Daniel F. Kissane Memorial Scholarship, which covers the cost of travel, lodging, registration fees and conference meals. The conference will be held June 3-5, 2015 on the Purchase College, SUNY campus. The theme of this year’s conference – The Art of Librarianship – reflects the fact that librarianship is not just a profession — it’s an art. Successful librarianship combines professional knowledge, skills, and experience with creativity, curiosity, passion, imagination, and vision. If you are considering a career in academic librarianship, this is a great opportunity network with a welcoming group of highly collegial and collaborative SUNY Librarians from all over the state, as well as sit in on conference sessions to learn about the current issues and innovations in academic libraries. The winner may choose to stay on campus (most conference participants take advantage of on-campus housing) or in a hotel (maximum $350.00) and will be provided a liaison to the conference to help settle in and meet people. Combining what you have learned in your library classes with your experiences as a student using an academic library, please write about a major challenge currently facing libraries and your ideas about meeting that challenge. Don’t be afraid to be creative! Suggested topics: Changing/adding services, utilizing technology, social media, the physical environment, role of librarians, funding, etc. The essays are due on or before May 8, 2015 and recipients will be notified by May 15, 2015. Send submissions to Kim Myers kmyers@brockport.edu. For more details about the conference visit SUNYLA 2015 Conference website https://sunyla2015.wordpress.com/.